A court sentenced two Reuters reporters who exposed human-rights abuses by Myanmar’s military to seven years in prison on Monday for obtaining state secrets, in a case that raised questions about judicial independence and became emblematic of the country’s faltering transition to democracy. 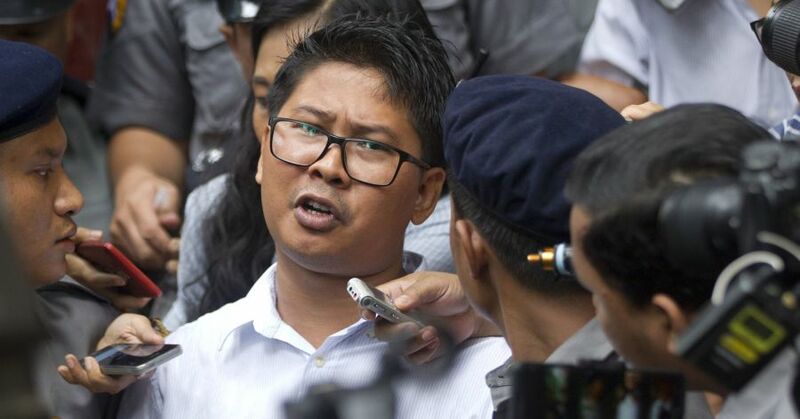 Defendants Wa Lone and Kyaw Soe Oo were entrapped by police officers who planted classified documents on them to disrupt their reporting into atrocities in Rakhine state, according to their defense. Myanmar has been accused by United Nations investigators of genocide in a crackdown launched a year ago against ethnic Rohingya Muslims that left about 10,000 people dead and forced more than 700,000 to relief camps in Bangladesh. Messrs. Wa Lone and Kyaw Soe Oo shed light on abuses that included the massacre of 10 Rohingya men and boys in the village of Inn Din. Their photos of the victims, who were tied together before being executed, prompted a rare admission of wrongdoing by Myanmar’s military, which has otherwise rejected claims that it violated human rights in what it calls an antiterrorism campaign.